Remember my little corn from a month ago? They were less than 6 inches then, but now they’re as high as pygmy-elephant’s thigh (is this a reference that anyone will catch? Is anyone a geek like me?). The wee corns, end of June. You can see the tire towers there, and we’ve taken the stack up to five tires. From now till harvest it’s just a waiting game. Cross your fingers! The final pile: 5 tires apiece, 3 varieties of taters. At the far end of the yard lies my favorite raised bed. Five weeks ago my ‘matoes were off to an awesome start, and they’ve just continued the awesome. They’re flowering and fruiting like crazy these days – I’ve never had such success. (fingers crossed!) I’m growing some green zebras, some goldens, red cherries, 3 heirloom stems I rescued from the nursery’s free pile, and a whole ton of plain ol’ straight up red slicers. SO excited! In late June, they hadn’t grown over the cage yet. Now, exploding out all over the place! I think that these are some cherries. Alongside the tomatoes are the cucumbers, a whole bunch I planted with pickling intentions. They’re starting to form little fruits right now, and it’s maybe the cutest thing I’ve ever seen in my life. Seriously, so adorable. 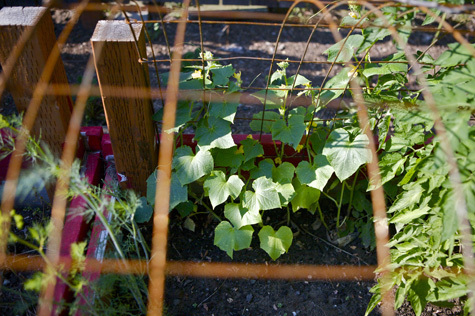 The cucumber vines, flanked by dill (left) and heirloom tomatoes (right). 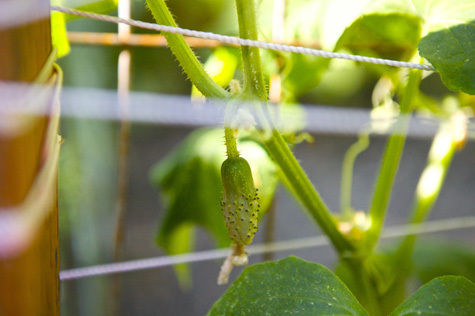 My first and biggest cuke, about the size and shape of a small lemon. Most of them look like this. Less than an inch long. There are TONS! 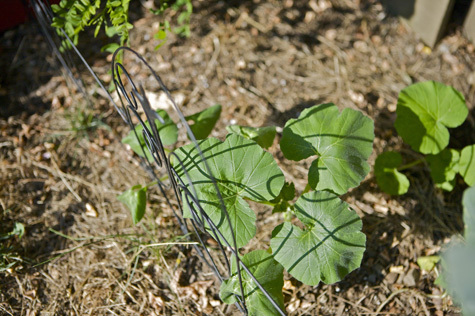 And last but not least, those pumpkins I transplanted mid Jun. Not too many of them made it, but the few that did are just beginning to take off. I’m taking good care of them, and have high hopes for Jack-O-Lanterns and pumpkin pie come fall. The little bugger right after the big move. Branching out and starting to creep, like a good little pumpkin should! So that’s about it, my dears. I’m still harvesting beets and berries, and drying out snow peas to save the seeds. 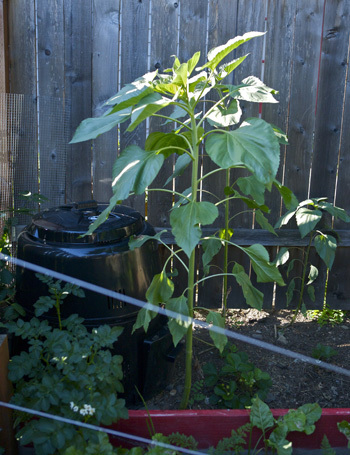 My broccoli has all bolted in this unbearable heat (over 100º today, hello?! ), but I’ll start another batch for fall. In fact, it’s time to start thinking of fall garden prep, but we’ll save that for another time. So, what are you growing, and how is it going? Nice to see someone’s garden doing well, especially tomatoes. Here in NY, I lost all of my tomatoes to blight and it’s sad, sad, sad. Even the farm I have a CSA with is hurting. I too am glad to see your garden progressing. I’m still stuck at the lots-o-green-but-no-fruit stage. I envy your ‘maters. Please keep documenting this so we can all see what success looks like. I see what you did there, if that is indeed an Oklahoma reference! 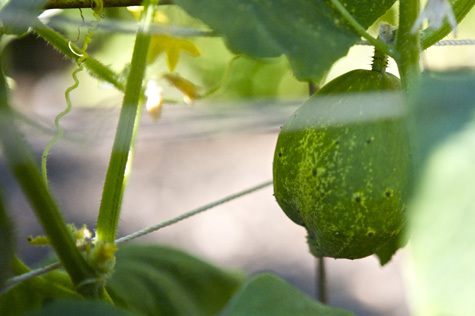 If it isn’t…well, you have a wonderful garden anyway! 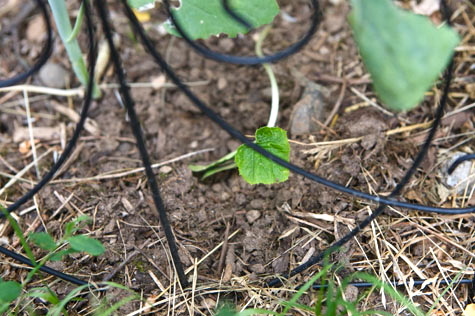 Re: Shana’s input, I was going to say, next year don’t transplant pumpkins (squash,beans, spinach, beets, corn don’t transplant well, but seed easily, all cabbage family plants, tomatoes, lettuce, peppers, eggplant etc. transplant easily and the tomato family needs the extra time growing under cover to get enough of a head start anyway), plant them by seed in mid-April and by now you will have monsters, You will be lucky to get full orange fruit of any size this year, (unless we have an amazing indian summer to follow this hot summer). Final note; listen to Greg Brown’s song ‘Canned Goods’ today or tomorrow, starts off with the phrase “warm as a July Toe…..May….Toe”. Beautiful, timely and moving. PS Your garden’s motto: “upward, onward and Sayward!”? 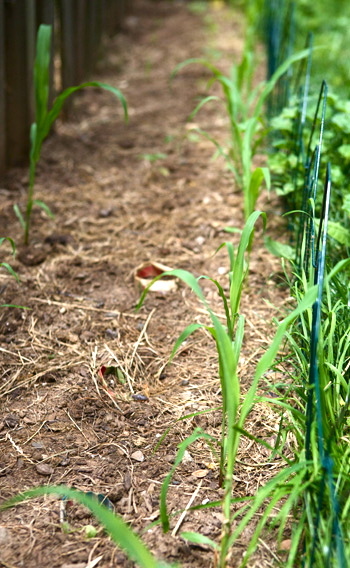 This week’s to-do list includes replanting our ENTIRE garden. Our tomatoes are all stunted and fried from the LA summer heat, and the only thing left that’s still doing well out of the lot of it is the rosemary. 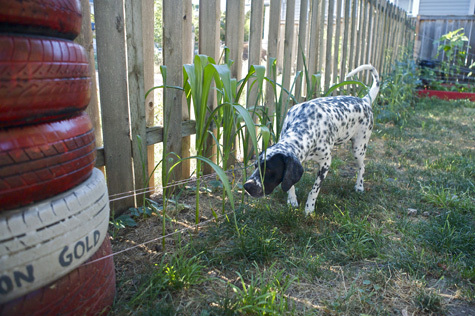 Last summer was our first garden effort, and we totally over planted everything. 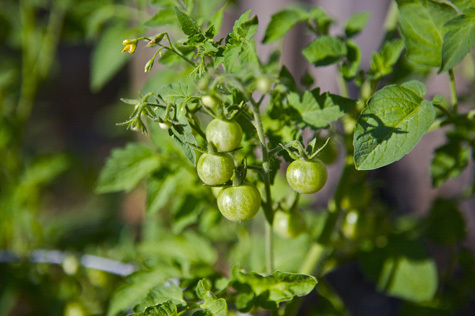 Is your tomato support system as simple as it appears to be? Do they just figure out how to grow up into it and are thus supported? Score on the free heirloom branches! It’s great that they save them. 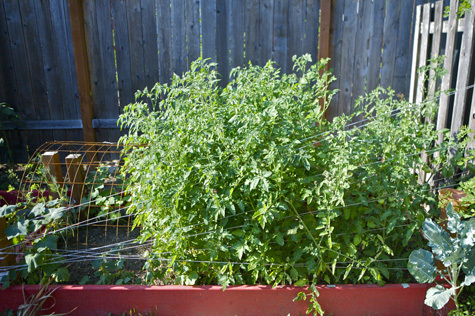 I made a bunch of new tomato plants one year by sprouting cuttings, just to see if I could. Fun stuff! @ me3 – Oh yes, there will be much documenting. Good luck with your greens, and the fruit that’s surely coming! @ Dylan – Thanks for your thoughts. I follow a PNW timing guide to a tee, so I’m pretty confident my crops will all bear. We shall see! @ Sam – Will we get domestic diaries again??? 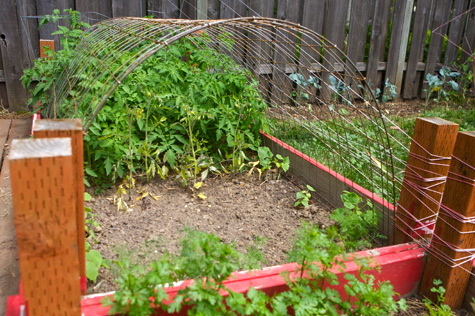 @ Joy – Well, there’s standard tomato cages in there too, but they’ve all grown up way past those already. I don’t quite know how they’re all standing up so tall – they’re a strong bunch this year! Yay for local organic seeds! @ Kelly – Starts are totally not cheating! I wish I’d planted more heirlooms this year, but I was planting with canning sauce in mind. But heirlooms are sooo delicious. Next year! Hello again Sayward. I was just searching your archives for “compost” and came across this one. 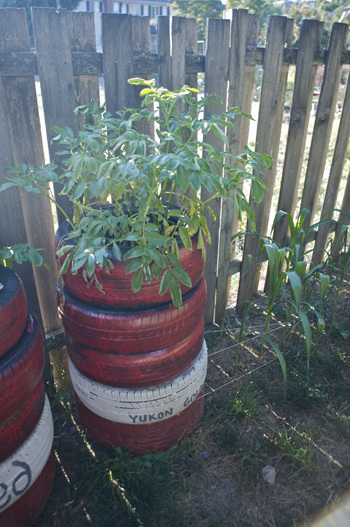 I was going to grow potatoes in old tires a few years ago and a friend brought up the fact of all of the chemicals and oil used tires might have in them. I was wondering if this is something you addressed and if so, how? Also I am not sure if you have done one or not, but an article about what all is compostable would be neat. I recently read one on another site and was very surprised to see some of the things that are compostable. Thoughts? @ Amy Petz – When I began the potato tire project, I looked into the chemical leeching issue. It seemed to me to be safe enough (I wouldn’t have done it otherwise! ), but of course I always encourage anyone to do their own research and make their own informed decision. Don’t just take my word for it! I’ve considered the post on compostables as well . . . consider it noted!